(18429, Elwyn Welch Collection, OHS). Zelia Breaux, a renowned musician and educator, was born to Inman Edward and Zelia Ball Page in 1880 at Jefferson City, Missouri. Her father was principal of the Lincoln Institute in Jefferson City from 1888 to 1898. Zelia Page attained a bachelor's degree in music from Lincoln. On May 1, 1898, Inman Page became president of the Colored Agricultural and Normal University (now Langston University) in Langston and moved his family to Oklahoma Territory. He hired his daughter, Zelia, as a teacher of piano and instrumental music. She established and developed the music department. On December 6, 1905, she married Armogen Breaux. The couple had one son, Enimen, who became a vice president at Langston University. 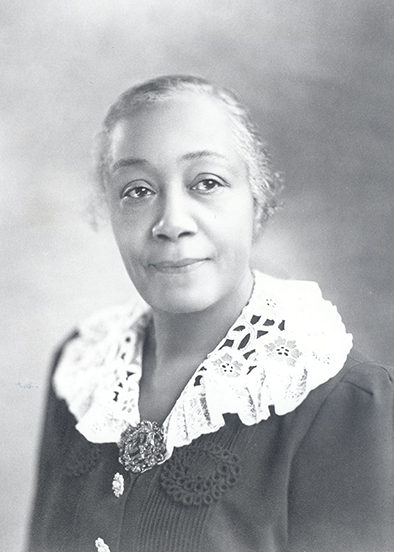 The Oklahoma public schools were segregated in 1918 when she left Langston and accepted the position of supervisor of music for the African American schools in Oklahoma City. As head of the music department at Douglass High School, she placed a music teacher in each African American grade school in the system. In addition, she organized the Oklahoma City Community Band, which was composed of many of her former Douglass students. The Douglass High School band, which she organized in 1923 with twenty-six participants, became one of the most outstanding in the United States. Appearing all over the nation, the band influenced both local and national musicians such as Duke Ellington, Noble Sissle, Eubie Blake, Sherman Sneed, Edward and Charlie Christian, and Jimmy Rushing. In 1933 Breaux took the Douglass band to the Chicago World's Fair musical festivities, and they performed for a national radio broadcast while there. In 1915 she had bought a controlling interest in the Aldridge Theater on Northeast Second Street, and it became the main location for performances of high school operettas as well as prestigious traveling shows. During her tenure at Douglass High School Breaux organized a twenty-four-voice chorus, an eighteen-piece symphony orchestra, and several boys' and girls' glee clubs. In 1932 she organized May Day celebrations, during which the Douglass band would play as the children wrapped the Maypole. In 1936 she took the Douglass band, which had grown immensely since 1923, to the Texas Centennial celebration in Dallas. In 1937 she started the Black State Band Festival, which began with seven participating bands and grew to eighteen. In 1939 Breaux received a master's degree in music education from Northwestern University in Evanston, Illinois. She retired from Douglass High School in 1948. Zelia Breaux died in Guthrie on October 31, 1956, at the age of seventy-six. She was inducted into the Oklahoma Women's Hall of Fame in 1983 and the Oklahoma Bandmasters Association Hall of Fame on July 25, 1991. Zella J. Black Patterson, A History of Langston University (Norman: University of Oklahoma Press, 1979). The 1926 Tellus Douglass High School of Oklahoma City Yearbook (Oklahoma City: Douglass High School and the Oklahoma City Public School System, 1926). Kay M. Teall, Black History in Oklahoma: A Resource Book (Oklahoma City: Oklahoma City Public Schools, 1971). Hannah D. Atkins, "Breaux, Zelia Page," The Encyclopedia of Oklahoma History and Culture, https://www.okhistory.org/publications/enc/entry.php?entry=BR010.